In today's global economy it takes twenty nine companies from 18 countries to have a simple cup of coffee. To produce a car it can take ten thousand suppliers from around the globe all of which in turn have their own suppliers. In this production distribution and consumption chain, trucks are the link allowing complex supply and logistics chains to operate efficiently, interconnecting all businesses markets and transport modes. Every item on every store shelf in every office and in every home has at one point if its production or distribution, been on a truck, so it goes without saying that trucks have become the vital lifeblood all economies. However these complex international supply chains are subject to non-harmonized and overlapping regulatory requirements and procedures that change from one country and region to the next. Field studies have shown that inappropriate customs procedures can account for up to fifty-seven percent of total transport time. Waiting times at Borders which can amount to hours days and even weeks, are an economic social and environmental nightmare for all involved and create an environment conducive to corruption making trade considerably slower and more expensive. Meet the TIR system. The TIR system is the simple global multimodal secure affordable customs transit system. easier, cheaper and more secure. A win-win for everybody. Today the TIR system issues three million TIR Carnets for up to 20 million border crossings of close to $100 million tons of goods per year with one billion US dollars in guarantees issued every day to cover the customs taxes owing on those goods. One last thing TIR has a strict public-private admission process the transport operators have to go through to become duly authorized TIR transporters. But that's what makes TIR the most secure and reliable customs transit system in the world. Ratified by close to seventy countries, the UN TIR convention has proven most effective for sixty years in some 60 countries worldwide, and 25 more countries are highly interested in getting on board. 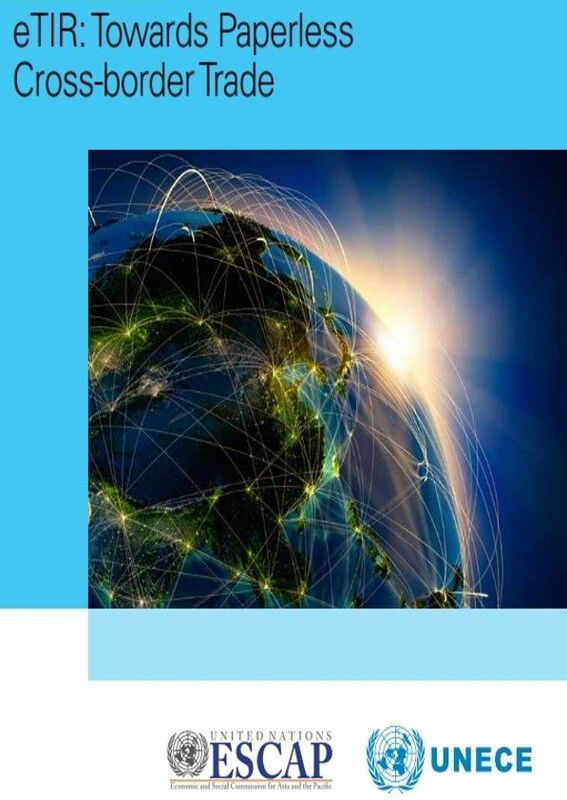 Globalisation of trade is an important challenge for the world economy in general. Increased competition means shrinking profit margins forcing to redefine production, supply and distribution processes and, consequently, to focus on the most efficient manner of moving goods. This increased demand on the mobility of goods is however hindered by invisible burdens such as waiting times at borders, high taxes and connected customs guarantees, an increasing focus on security of transported goods, etc. Transit facilitation is therefore an essential element for competitiveness and economic growth. Various physical and non-physical barriers undermine the potential of cross-border trade in developing countries. In the region, trade and transport are often challenged, not only by insufficient physical infrastructure, but are also affected by complicated cross-border formalities and procedures and lack of coordination among various stakeholders. In particular, inefficiency and fraudulent activities within customs transit procedures have been crucial challenges that developing countries have faced in order to enhance their competitive positions in global markets. In light of today’s extremely rapid technological advancement, including the Internet and smart cards, the introduction and promotion of paperless trade measures have become of great interest in both the public and private sectors. These information and communication technologies (ICT) based trade facilitation measures are expected to increase the efficiency of trade procedures while reducing the rate of fraudulent actions among participating parties in cross-border trade activities such as customs clearance, transit, transport, warehousing, guarantee and insurance. Although the advantages of paperless solutions are well recognized, implementation of a paperless transit system could be challenging, especially for developing countries. What is the TIR System? TIR stands for Transports internationaux routiers (International Road Transport). In practice, it is an international Customs transit system for goods carried by road which facilitates international movement of goods across the borders of countries that have ratified the TIR Convention, while offering a high level of security. The TIR System enables door-to-door transport with minimum interference at international borders of contracting parties to the TIR Convention and thus serves, in the best possible way, international trade and the economies of all the countries involved. 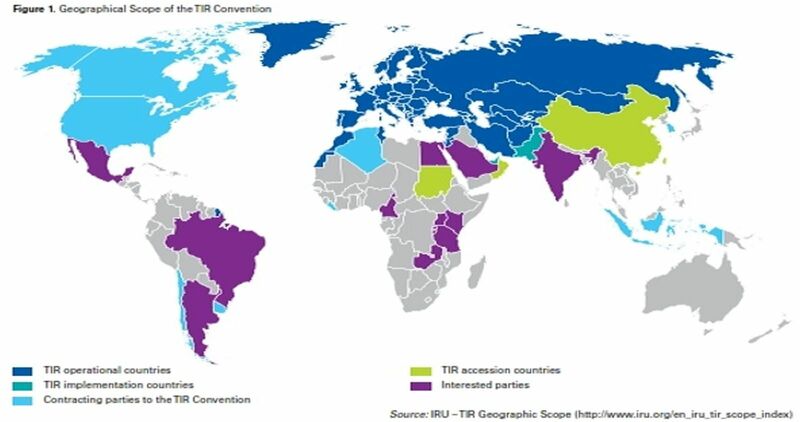 Today, the TIR Convention of 1975 has been ratified by 68 countries all around the world and is currently operational in 57 of the contracting parties, covering a geographical scope from Lisbon to Vladivostok, and from Narvik to Agadir or Tunis. Pre-Declaration). After strict selection and approbation from national Customs authorities, the TIR Holder is entitled to use a TIR Carnet. This TIR Carnet, representing both the Customs transit declaration and the evidence of an international financial guarantee, is duly completed and stamped by Customs Authorities who seal the load compartment at departure, and thus ensures the integrity of the load to the Customs Authorities at all successive border crossing points, while avoiding time-consuming inspections or bond deposits at each border. What is the added value for African States? To achieve their objectives of economic integration at regional and continental levels, African States need a barrier-free access to the world economy and market so that its competitive trade goods can flow with the minimum transport costs. Moreover, the predicted expansion of the TIR System in the near future will also bring very important opportunities to the road transport industry in the region as well as trade. The TIR System has been fully operational in Europe, CIS for a long time and the Middle East for a few years, especially in Morocco and Tunisia, Lebanon, Syria, Jordan and Kuwait. Moreover, the governments of Egypt, Saudi Arabia and Yemen are also considering the TIR System as an important tool for the development of their trade, while China is taking steps to access to the TIR Convention. The recently created IRU Regional Committee for Africa (CRIPA), which counts 27 Members from 22 countries and through FESARTA covers in total 38 countries, has adopted on the 4 May 2012 a Resolution calling African Governments to join the main UN trade and transport facilitation Conventions and in particular the UN International Convention on the Harmonisation of Frontier Controls of Goods (1982) and the TIR Convention. Already the Governments of Cameroon, Senegal and Ivory Coast have shown interest to join the UN International Convention on the Harmonisation of Frontier Controls of Goods and the TIR Convention to facilitate flow of incoming and outgoing traffic, in particular of containers, in the ports, and to ensure their secure delivery in the hinterland. Road transport has become a vital production tool, driving peace and prosperity. On those grounds, the smooth implementation of the TIR System is crucial. However the successful implementation of the TIR System is also dependant on countries joining other UN Conventions connected with transport and trade facilitation, dealing with issues such as road traffic, road transport of dangerous goods and perishable foodstuff, etc. IRU is dedicated to assist all involved in this process.